Ads on this Blog - Life is a lucky bag! Sometimes you can find ads on Life is a lucky bag. I'd like to take a few minutes to explain what kinds of ads you can find here and why. An Affiliate-Link is a link to a big online-store where you can directly shop the mentioned product. I usually link to Amazon and sometimes to other smaller online stores. If you shop the product via the Link I will receive a small provision. This helps me to maintain my blog - for you, the price will stay the same! Anyways, I only link to products I am really convinced of! I review two different kinds of gear. Most times the gear I am reviewing is something I bought for myself. Sometimes different shops or brands send me something I can use on my trips. Afterwards I ususally write a review for them/their website or give them a personal feedback. 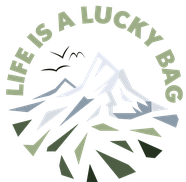 If I feel like, I also write a blogpost on Life is a lucky bag, but I am never paid for those posts. The only "payment" I get is the free gear - that's it. I usually also link the gear with Affiliate-Links. If I am reviewing a store or an online store, I am reviewing it because I am convinced of their products and/or their ideas. I am not paid for those posts and usually they do not include Affiliate-Links (unless stated). I hope this gives you a good and transparent overview on how I handle advertisement here on Life is a lucky bag. If you have more questions, don't hesitate to ask and I will happily answer all your mails and messages!